In the advanced game, scoring modifiers increase the fun. And the expert game constantly provides new challenges through various additional tasks. Note: In order to set the timer, always turn it one complete turn, then turn it back to the desired number of minutes! Place the stack so that it's easily reachable by all players. 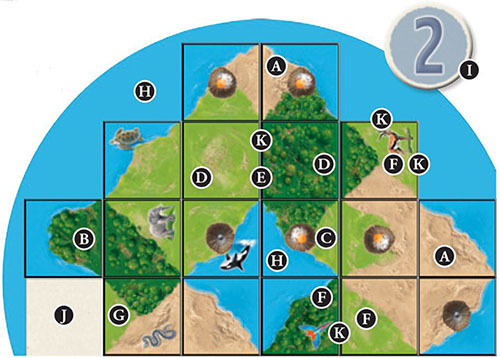 Each player receives 1 World Board and places it with the Water Side up in front of him. In addition, each player takes 1 Score Sheet and 1 Pen (not included). Place the Volcano Chip and the Timer aside, close at hand. 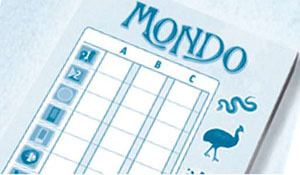 You do not need the Scoring Modifiers and Additional Tasks in the beginner game. Simply place them back in the box. Tip: 4 spaces of your World Board are slightly highlighted. This is only significant for solo play. A game runs for 3 turns. At the beginning of each turn, set the timer for 7 minutes. Place the timer so that all players can see the time remaining. One player counts down "3...2...1...go!" During this countdown, all players scramble the landscape tiles (hereafter just tiles). At "go!" all the players cease shuffling the tiles, and the turn begins. Now, you all look simultaneously for the tiles you want to place on your board. The first tile can be placed on any space of your choice. Every subsequent tile must border at least one edge of one or more previously laid tiles. The orientation of the tiles may be chosen freely. (That is, the animals may therefore be facing sideways or upside down). You should arrange the tiles so that as much as possible the landscapes on the edges of neighboring tiles or the edge of the board match: plains to plains, water to water, etc. Nevertheless, it is allowed to place tiles so that one or more edges do not match! Every two neighboring edges which do not agree, count as 1 misconnection. Also, each edge that doesn't match the edge of the board counts as 1 misconnection. 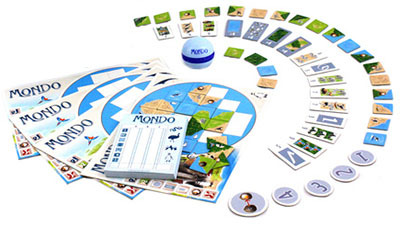 Each player may use only one hand for looking for and placing tiles. You may shift the tiles in the middle of the table, but may not dig in them. Turning around tiles is permitted, because the front and back sides are always different. You may choose freely which side to place on your board. You may have no more than 1 tile in your hand at any time. You may place the tile in your hand either on your board or back in the middle. You may not remove, rotate, or move a tile you have placed on your board. You may only place tiles on open spaces, not on top of one another. You can jump out of the current turn at any time, as long as the timer hasn't run out. It is permitted to do so even if you have empty spaces on your board. In order to jump out, simply take the topmost bonus chip and place it in front of you. Thereafter you may not intervene in the game play! A turn ends as soon as all players have jumped out or the timer runs out. If the timer has run out, you must end all actions. You may not take anything more (including a bonus chip) nor place anything more. If you have a tile in your hand when the timer runs out, place it back in the middle of the table. If you have a bonus chip in your hand, you may keep it and place it in front of you. Now, you take score. See how many points each player has accumulated. Simply go down the score sheet and enter the points in the appropriate places. In the first turn, use Column A, in the subsequent turns, Columns B and C.
Every animal always counts as 1 plus point. Tip: It's easiest to count all the landscapes of a given kind at the same time, e.g., all deserts, then the next kind, etc. The player with the most active volcanos receives 1 minus point for each of his active volcanos. If players are tied for the most, they each receive the appropriate minus points. Inactive volcanos are not taken into account on the first turn (see Next Turn). 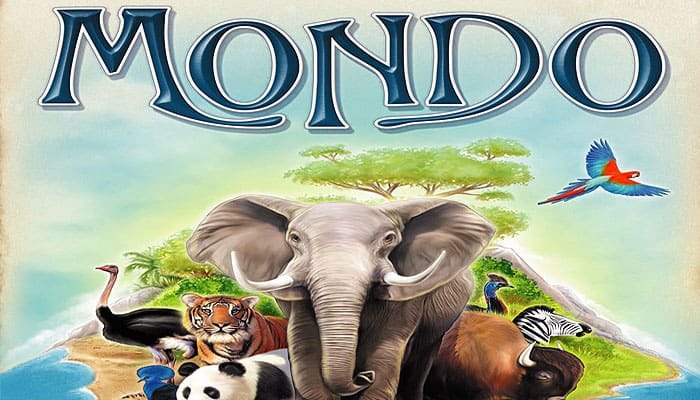 Example: Marianne has 6 animals and therefore receives 6 plus points. Her board has 4 completely enclosed, mistake-free landscapes: 2 deserts A, 1 forest B, and 1 plains C, for which she receives 8 additional plus points. The two D landscapes are enclosed, but not mistake-free E. Also, the F landscapes contain mistakes. The plains G is not enclosed. Water landscapes H bring no points as a rule. For the bonus chip I, Marianne receives 2 plus points. Volcano scoring: Marianne has 4 active volcanos. (She may ignore the two inactive volcanos in the first turn.} Her fellow player Ginger has 5 active volcanos on her board (not shown}. Ginger receives 5 minus points, Marianne none. Marianne receives 1 minus point for the empty space J as well as 4 more minus points for the 4 misconnections K.
The player who received the most points in the turn that was just scored gets the volcano chip. If there is a tie for most points, the volcano chip counts for all of them. In the next turn, this player (or players) have their inactive volcanos scored as if they were active volcanos! In the previous example, if Marianne had the volcano chip, she would have had 6 volcanos counted, 4 active and 2 inactive. Then she would have had more volcanos than Ginger and would have received 6 minus points. Place all the tiles and bonus chips back in the middle as at the beginning of the game. Set the timer back to 7 minutes, and start the next turn as before. After 3 turns, add up the points in Columns A, B, and C. The player with the most points wins the game. In the case of a tie, there are multiple winners.